“Young talent” begins with a situation I experienced myself when I was 18. A man I met through CB radio (Facebook of the 70’s) had convinced me that he didn’t have any sexual interest in me, became a good friend of our entire family and only then started to seduce me in such a subtle way that it cannot be described. But it can be expressed perfectly through a screenplay. The atmosphere and unintended comedic moments of a dysfunctional family who closes their eyes to problems, and the creepy behavior of a man who is an expert at convincing people to do what he wants, is so well captured in this screenplay that even after reading it for the twentieth time, it gives me the creeps. 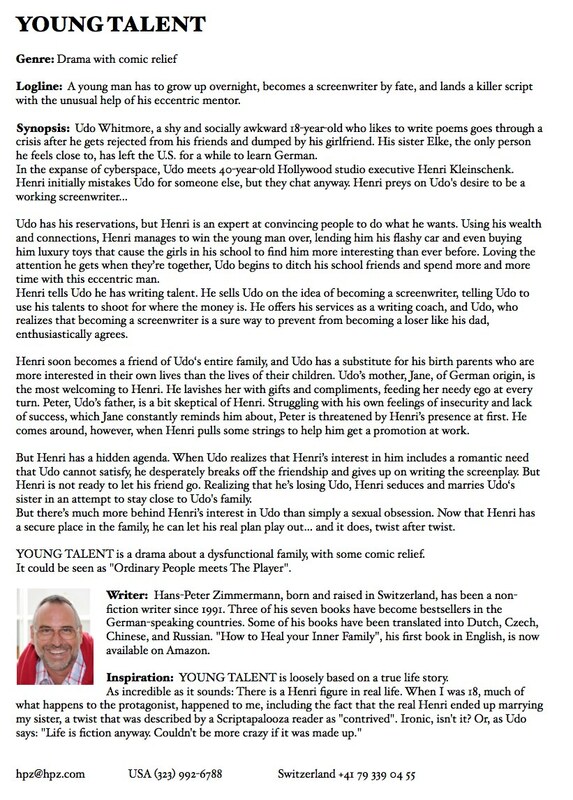 However, I wouldn’t be Hans-Peter Zimmermann if I hadn’t transferred the story to the flashy world of Hollywood and made it into a quirky comedy which demonstrates that all bad experiences can be turned into a blessing. P.S. Here is the one-sheet, for those of you who still believe in that short stuff. Click to download the PDF of the OneSheet! Click to download the PDF of the whole script! 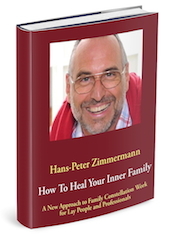 How to Heal your Inner Family represents a novel approach in systemic therapy: while most systemic therapists derive from a specific conflict to solve it using systemic techniques, Hans-Peter Zimmermann’s “six systemic checks” are a kind of mental spring cleaning, which one can perform on each client (or even should). The practical index also provides quick access to all kinds of possible systemic situations and their solutions. Laurie Lamson, editor of the “Now Write” book series.